I know it’s easier to imagine that those “gays” are some other people, some other place, not here, not anyone we know. Then your child comes out. Meanwhile, all those things you said about “those gays” are ringing in your child’s ears… and have been for years. If your child is not the one who is gay, you can bet that someone you know is. Even your nice, conservative, Bible-preaching church has gay people in it, because gays didn’tchoose gayness–they just are. It reminds me of the story of the soldier, just returning from war, who called home from the nearby pay phone before just showing up on the doorstep. “Mom, I’m coming home! Yes, I’ll be glad to see everybody, too. But… I’m bringing my buddy with me. He lost his legs in battle so he’s in a wheelchair. But I hope you won’t mind.” Then he listened as his mom explained that they don’t really have room, and that the house is not set up for a wheelchair, and she’d prefer he not bring his buddy home. “Yeah, I understand.” Then the soldier–who had no buddy with him, but was himself confined to a wheelchair after being injured in battle–shot himself and took his own life. He had used the story to test the water, and decided he would not be that burden to his family. I am not kidding when I tell you that your kids, or your friend’s kids, are testing you to learn what you are truly thinking. Most of them know someone who’s gay, that’s certain. You cannot prevent your son’s getting injured in war, but you can love him unconditionally when he rolls in in a wheelchair. And you cannot change your LGBTQ son or daughter, but you can love them as God told you to love them. I personally know parents who have found their gay child hanging from a rope or with their brains blown out. If you now feel assaulted by such a gruesome image, then that’s all the more reason to be part of the solution instead of unwittingly being part of the cause. That means creating a welcoming environment for anyone… and that means anyone. Because someone you love might just be navigating their way through an environment you’re helping maintain. Jesus did not call us to discriminate on those we don’t agree with–he told us to love others and let him be God. Don’t let this scare you–Christ-followers have no reason to be scared. We have an enormous God! 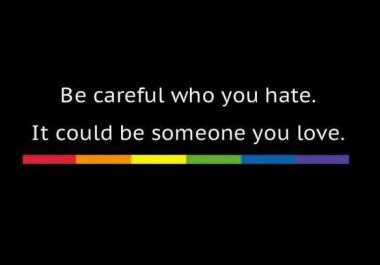 As the PFLAG slogan says… Be careful who you hate, it could be someone you love. Don’t Hate Someone You Love « FreedHearts.